We charge a flat rate shipping cost of $9 per order for orders up to $100. We usually use USPS Priority Mail but reserve the right to use another carrier or service, solely at our discretion. 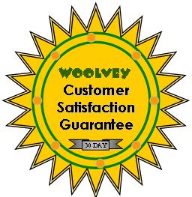 Larger items and more valuable items may be more expensive to ship but unless explicitly stated on the item, Woolvey LLC will pick up the additional shipping cost. Shipping on all orders over $100 is free. The total of your order must be at least $100 before the application of any tax or shipping costs. The cost of shipping includes any handling effort and insurance against breakage. Note that we only ship within the continental U.S. as standard. We will consider International shipping on an individual basis, if requested, and provide customized shipping costs in each case. The items we sell are not new (unless stated). They are pre-owned, often very old and often very rare pieces. As such, the condition of each item may not be the standard you would expect of a brand new item. We thoroughly check each item and clearly state if any item shows any significant defect or wear, including any cracks, chips, lost paint/glaze, crazing, repair/restoration or other missing feature. If we do not explicitly state that an item suffers from a specific defect, then you should be assured that it is in 'mint used' condition, meaning that it is as perfect as you could expect for an item of its type and age. Even when new, many of the items we sell will have variations in color, shade or some other aspect, purely as a result of being hand-crafted and/or hand-painted. Certain hues and styles may be more appealing to you than others. We do not use stock pictures to display products. Each image displayed is of the actual item for sale. The only exception to this rule is if we have several copies of the same product item, which may vary slightly if hand-painted. If you are interested in an item but would prefer to see more pictures or different angles, we can accommodate these requests through our contact us page. Simply state the item you are interested in and what specific pictures you would like to see. Also note that original packaging and documentation is not included with an item unless explicitly stated in the description. Please read the descriptions carefully and contact us if there is any confusion. We make every effort to ensure that the condition of our products is accurately described but if you are still dissatisfied with your purchase our thirty (30) day limited satisfaction guarantee may be invoked. It is our goal to satisfy with every purchase. If, for any reason, the item purchased is not to your satisfaction, you may return it for a full refund within thirty (30) days. Please note that the refund will cover the cost of the item purchased, applicable sales tax and the cost of shipping to you. It will not cover the cost of return shipping back to us. We also ask that you inform us as to why the item did not meet your satisfaction, in order to reduce the risk of future satisfaction issues. This guarantee is valid for thirty (30) days from shipment until notification of dissatisfaction. Refunds will be processed within 48 hours of the successful return of an item.